We’ve just released a large software update for our digital beam steering column speaker VIDA L, which is available for download right now. Amongst other things the new product range VIDA M is also supported. In addition to the firmware, there is also an update for VIDA App. Further info can be found on our website. In order to be able to update the firmware of VIDA even quicker and easier, we’ve made the new “VIDA L Firmware-Updater” available for download. Also the K&F SystemAmp Library was updated to version 1.3. The presets for the new K&F SPECTRA series were added and several presets were optimized, for example the SCENA 15 in combination with K&F SystemAmps. K&F SCENA series monitor speakers are professional tools for use on stage. They provide the musicians what they need: clear and exact feedback. New to this series is SCENA 12, even more compact and impressive in performance. The new SCENA 12 can also be used with linear power amps and therefore allows for an even more flexible and cost-efficient use. It is the first choice even in cramped conditions and delights with its big sound and small measurements. K&F SPECTRA 212 is a compact 3-way-High-Power top which combines very high maximum output with optimal directivity. As an array-capably Line Source, K&F SPECTRA offers great scalability and therefore a wide spectrum of use. Because of the K&F VariQ-Technology it can be used either as a single Point Source or in a Line Source-cluster. In this case, the patented K&F VariQ-unit is rotated 90° in just a few steps, to switch between both modes of operation. For optimum use of K&F SPECTRA 212, there are presets for K&F SystemAmps available. For the K&F SystemRack, there are LS-Blocks with Legacy-Support available as well. 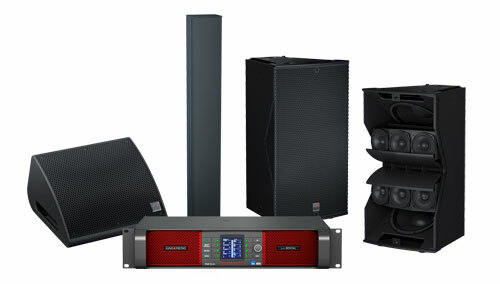 The amp series designed for live-/rental- and installationapplications is equipped with Kling & Freitag-Module Presets exclusively for K&F loudspeaker systems. The new model K&F PLM 5k44 offers a cost-effificent entry for the series with a total output power of 5 kW (1250 watts per channel). All major features for effective and successful work are equal to the larger models of the series: Lake Processing, DANTE®, AES/EBU, Rational Power Management for unequal power distribution between channels, wide range power supply with active PFC, Breaker Emulation Limiter and many more. Derived from our very successful VIDA L/C series, the K&F VIDA M 110 and K&F VIDA M 220 of the K&F VIDA M series are currently in beta test phase. These primarily for installation purposed designed speakers will complete Kling & Freitag’s lineup of speakers from 2019 on. With its visually discreet appeal, the K&F VIDA M fit in any environment unobtrusively. The special water- and temperature-resistant construction enables them for outdoor use. And they sound much bigger than they are! The new PASSIO W, a 100° horizontally-covering version of the already established PASSIO, is now available. Universally applicable, i.e. as effects speaker, fill or at voice-based events, this speaker presents itself as a self-consistent addition to the K&F PASSIO product line.